Cazenovia College and the Dorothy and Marshall M. Reisman Foundation are pleased to welcome Luba Lukova to Cazenovia. 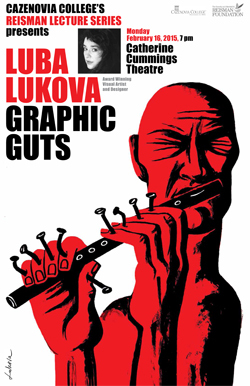 Regarded as one of the most distinctive image makers working today, artist, graphic designer and social activist Luba Lukova focuses on issues such as peace, censorship, immigration, ecology, hunger and corruption. Whether using an economy of line, color, and text to pinpoint essential themes of the human condition or to succinctly illustrate social commentary, her award-winning work is undeniably powerful and thought provoking. Widely exhibited nationally and internationally, she is also the author of the critically acclaimed Social Justice poster portfolio, and her new book, Graphic Guts. Lukova's work is currently on view at New York's Museum of Modern Art as a featured image for the newly opened exhibition "Designing Modern Women." Most recently, her posters are on display at the Denver Art Museum and at La Fête du Graphisme in Paris. Lunch with Students (sponsored by SGA; by invitation only) – 12: 30 - 1:30 p.m.